The new edition of this comprehensive careers encyclopaedia has been updated and, following customer feedback, we have condensed it into a more manageable size. It still contains 750 job profiles arranged into job families and a full alphabetical index. Each job profile includes; basic information, work activities, personal qualities and skills required, pay and opportunities, entry routes, training and qualifications and adult opportunities. 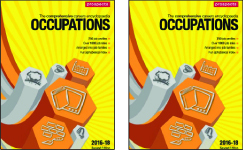 Each section includes a list of organisations providing further information about the occupational area.